The Bull Run Mountains Conservancy is located in just west of Haymarket, VA, 30 miles west of DC. Covering 2,486 acres, the mountains overlap into Fauquier and Prince William Counties. The Bull Run Mountains are the eastern-most mountains in Virginia and part of the Blue Ridge Mountain Range, which spans from Pennsylvania all the way down to Georgia. 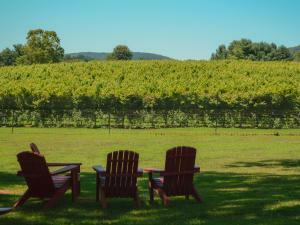 You can see views of these beautiful, blue mountains from various attractions in Prince William & Manassas, including the Manassas National Battlefield Park and the Winery at La Grange. There are ten miles of trails to explore. Along your hike, you may experience white, quartzite cliffs, boulder fields, and rare woodland species. Keep an eye out for animals including bears, ravens, and rattlesnakes as you hike through these mountains. Just don’t try to take a selfie with a rattlesnake like this guy did. In addition to natural landmarks, plants, and animals, you may also find family cemeteries, ice house remains, and the site of a homestead. Note: The High Point Cliff area will be closed for an indefinite period of time for restoration and recovery purposes. During your hiking adventure or nature exploration, you may want to find a warm, dry place to stay and a good restaurant to grab a bite to eat. Below are some great options for dining and accommodations. Because the mountains are named the Bull Run Mountains, you may have guessed that they are located near the site of two Civil War Battles, the First and Second Battles of Manassas/Bull Run. This means that the Manassas National Battlefield Park is a popular attraction among those exploring the area. In addition to this awe-inspiring national park, however, there are many other great attractions. See the map below for additional activities and attractions in the area.